With summer vacation starting for many kids, now is a good time to use some of their free time to teach them about money. There are many free games online that can help you teach kids the basics of personal finance. Below are a few designed for kids 5-12. 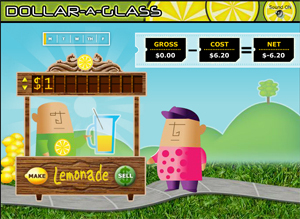 Run a lemonade stand while learning about supply, demand, profit, costs, and more. Different challenges to help kids recognize coin currency. Sort coins into the correct jars, count coins, and more. Test your financial knowledge on the gridiron. Play against the computer or against your friends. Go Hawks! Build a farm and watch your crops grow. Be careful not to get yourself into too much debt though. Fun game from the US Mint that helps kids recognize currency and values. Catch coins underwater so you can buy sails for your boat and escape the sea monster.